The clinical features of neurofibromatosis type 1 (NF1; also referred to as peripheral neurofibromatosis),  the most common form of the disease, were reported in several family members by German pathologist Virchow in 1847, but it was his student von Recklinghausen who 35 years later described the histologic features of the syndrome that often bears his eponym (ie, von Recklinghausen disease). Skeletal complications of NF1 can be categorized as generalized or focal manifestations. Multiple neurofibromas in 28-year-old man. Radial and ulnar bowing and obliteration of intramedullary spaces. Neurofibromatosis type 2 (NF2), or central neurofibromatosis, is associated with bilateral vestibular schwannomas and multiple spinal schwannomas. NF1 and NF2 are genetically distinct disorders despite the similarity of their names. Segmental neurofibromatosis is characterized by features of NF1 involving a single body segment. Typically, only a single segment of the body (such as the left upper extremity) is affected with café-au-lait spots and freckling, and lesions usually do not cross the body midline. Early neurofibromatosis literature recognized that a mild form of NF1 existed, consisting primarily of familial café-au-lait spots. Since then, multiple families with such mild involvement have been found to have mutations in the SPRED1 gene. This condition, now called Legius syndrome, can present with multiple café-au-lait spots, freckling, macrocephaly, and mild learning disabilities, but does not present with any of the benign or malignant tumors associated with NF1. Schwannomatosis is a distinct form of neurofibromatosis that typically involves multiple schwannomas throughout the body, but without the vestibular schwannomas typical of NF2. It is most commonly a disease of adulthood that consists of multiple deep painful peripheral nerve sheath tumors, which may occur in a generalized form or in a segmental distribution. NF2, segmental neurofibromatosis, Legius syndrome, and schwannomatosis do not appear to have any bone involvement or other orthopedic manifestations. As a result, they are not discussed in this article. Spinal changes in individuals with NF1 are usually divided into cervical, thoracic, lumbosacral, and spinal canal pathologies. Features of the cervical spine in patients with NF1 have not received enough attention in the literature. Cervical abnormalities occur much more frequently when a scoliosis or kyphoscoliosis is present in the thoracolumbar region, in which case the examiner's attention is focused on the more obvious deformity. The manifestations of NF1 can be observed as dystrophic changes in the vertebral body, or they can be due to pathologic alignment. The most common abnormality observed is a severe cervical kyphosis, which in itself is highly suggestive of the disorder. Attention also should be paid to the C1-2 region. Isu et al. described three patients with NF1 who had C1-2 dislocation with neurologic deficit, and all improved after decompression or fusion. No bony changes in the C1-2 relationship were observed on flexion-extension views in any of these patients. Most of the problems in the cervical spine in this study occurred after excision of the tumors, which included resection of the laminae and posterior elements. Postoperatively, the spine is unstable and tends to develop progressive kyphosis. All patients with NF1 who undergo surgery, who require endotracheal anesthesia, who undergo halo traction, who complain of neck pain, or who present with neck tumors should undergo a cervical radiographic series. If subluxation is suspected, computed tomography (CT) scans, magnetic resonance imaging (MRI) scans, or both are appropriate. Other reasons for obtaining cervical spinal radiographs in a patient with NF1 include the evaluation of torticollis and dysphagia (symptoms indicating intra- or extraspinal neurofibromas). The authors have seen significant progressive kyphosis following occipitocervical decompression in young children. Deformity progression is silent and may not be noted. Nothing less than biannual imaging follow-up is mandatory. Any patient with any evidence of instability after an operative procedure on the spine that requires laminectomy should undergo spinal fusion. Scoliosis is the most common osseous defect associated with NF1. It may vary in severity from mild and nonprogressive to severe curvatures. The cause of this spinal deformity is unknown, but some have suggested that it is secondary to endocrine disturbances, mesodermal dysplasia, and osteomalacia (a localized neurofibromatous tumor eroding and infiltrating bone). In a general orthopedic clinic, 2% of patients with scoliosis have neurofibromatosis, whereas in a neurofibromatosis clinic, 10-20% of patients have some disorder of the spine. All preadolescent children with neurofibromatosis should be evaluated with scoliosis screening, or the Adams bend test, to exclude a spinal deformity, which usually occurs earlier in children with neurofibromatosis. Two primary types of scoliosis are observed in persons with neurofibromatosis: dystrophic and nondystrophic. Dystrophic scoliosis is the short-segmented, focal, sharply angulated type that includes fewer than six spinal segments. It has a tendency to progress to a severe deformity. [11, 12] Dystrophic curves may be associated with kyphosis and have a higher incidence of neurologic injury. The second type of curvature, nondystrophic scoliosis, is similar to the idiopathic curvature observed in adolescents. This form usually involves eight to 10 spinal segments. The deformity is most often convex to the right; however, this is not consistent. Compared to dystrophic curves, nondystrophic curves tend to present in older children with less angulation and rotation of the deformity. Patients more likely to develop progressive scoliosis are children younger than 7 years who have thoracic lordosis (sagittal plane angle < 20°) and paravertebral tumors. Curves that acquire either three or more penciled ribs or a combination of any three dystrophic features as described above (modulation theory), will almost certainly progress. Durrani et al  defined modulation as a process by which a nondystrophic curve acquires the features of a dystrophic curve and behaves as a dystrophic curve. They reported that modulation occurred in about 65% of their patients. Meningoceles, pseudomeningoceles, dural ectasia, and dumbbell lesions are all related to the presence of neurofibroma or abnormal pressure phenomena in and around the spinal canal neuraxis. High-volume or contrast MRI should be used in the investigation of all dystrophic curves prior to treatment. Occasionally, these intraspinal elements may directly compromise the cord when instrumentation and stabilization are attempted, or they may cause erosive changes in the bone, preventing primary fusion. The cervical spine should be evaluated with the initial scoliosis investigation. Evidence of dystrophic changes may be present on a true lateral view. Progressive cervical kyphosis is usually apparent after excision of the posterior elements. The patient presents with a neck deformity after anterior and posterior excision of a neck mass. If any suspicious area is noted on plain radiographs, right and left oblique views should be obtained to look for widening of the neuroforamina. These may represent dumbbell lesions (ie, widening of the neuroforamina caused by dural ectasia or the exit of a neurofibroma from the spinal canal). Kyphosis observed in individuals with NF1 is distinguished by acute anteroposterior angulation. Vertebral bodies may be deformed so severely that they are confused with congenital deformities. It may occur by gradual scoliotic rotation and progression or it can be found early in the disease with an abrupt angular kyphotic curve. Severe kyphosis is the most common cause of neurologic deficits in NF1. Lordoscoliosis has not been as frequently reported in patients with NF1 as kyphoscoliosis has. However, lordosis of the thoracic spine predisposes to significant respiratory compromise and mitral valve prolapse. Spondylolisthesis is a rare disorder that is most often associated with a pathologic luxation of the vertebra because of erosions of the pedicles or pars from foraminal neurofibroma or dural ectasia. Tibial bowing occurs in 1 per 140,000 live births. The bowing associated with NF1 is always anterolateral. The deformity may appear before other protean manifestations, such as café-au-lait spots. It is usually evident within the first year of life, with a fracture not uncommonly occurring by the time the child is aged 2-2.5 years. Conversely, posteromedial congenital bowing, or kyphoscoliosis tibia, is a benign condition. Tibial bowing associated with skin dimpling, ring constrictions, and foot deformities is rarely associated with NF1. The management of this anterolateral bowing deformity is most frustrating. Unlike scoliosis, treatment of congenital pseudarthrosis of the tibia does not appear to be more successful when it is initiated early. The treatment of nondystrophic curvatures is very similar to that of idiopathic scoliosis. Curves of less than 25° should be observed. Curves between 25° and 40° can occasionally be treated successfully with bracing. Once beyond 40°, surgery by posterior spinal fusion is usually indicated. Dystrophic curvatures of less than 20° should be observed for progression at 6-month intervals. For persons with curvature greater than 20-40° of angulation, a posterior spinal fusion with some form of segmental spinal instrumentation is recommended. Curves greater than 50° should be treated with anterior and posterior fusion. Oblique radiographs are obtained every 6 months to exclude pseudarthrosis. Brace treatment has not been consistently effective. For the very young child, early fusion causes minimal stunting of growth. Furthermore, the dystrophic segments have very limited growth potential to begin with. In these young children, nondystrophic curvatures of less than 20° should be observed, those of 20-35° should be braced, and those of 35° or greater should be stabilized by means of anterior and posterior fusion with segmental spinal instrumentation. Growing rods have been used in very young children with NF1 to obtain correction without definitive fusion and to lengthen or “grow the spine” every 6 months, but with varying success and a high rate of complications. The MAGEC Spinal Bracing and Distraction System (NuVasive, Aliso Viejo, CA), which does not require operative intervention for lengthening, may be beneficial in managing the skeletally immature patient, but there is no current experience with this approach. Bracing is recommended for patients with kyphosis of less than 50°. In patients with curvatures greater than 50° that fail to correct on cross-table lateral x-rays taken hyperextended over a bolster, anterior surgery (intervertebral discectomy, rib strut grafting, and bone chip grafting) is required, followed by posterior segmental instrumentation. Once a curvature exceeds 70° and fails to correct as above, surgery is strongly indicated. Bracing is required after spinal surgery until there is evidence of bony fusion. Because of the association of paraplegia with kyphosis, physicians have tended to perform laminectomy. Laminectomy alone for kyphotic cord compression is absolutely contraindicated. The offending neurofibromas are usually anterior, and decompression should be performed anteriorly. The removal of the posterior element predisposes the spine to instability by removing valuable bone stock required for fusion. Anterior release and intervertebral fusion followed by posterior instrumented fusion is considered as the most reliable surgical option to achieve correction of dystrophic lordoscoliosis. Sublaminar wires, pedicle screws, Universal Clamps (Zimmer Spine, Bordeaux, France), or rod-multiple hook constructs can be used. Anterior and posterior stabilization is recommended for progressive deformity. Progression of spondylolistheses from grade II to grade III or the presence of pathologically elongated pedicles with or without pain are indications for surgery. Fusion may be delayed because of the forward traction effect of the vertebral bodies and the slow healing and remodeling of bone in NF. Postoperative immobilization is indicated until the fusion is absolutely solid. Dural ectasia may completely erode the pedicles in this condition and continue to do so after a successful spinal fusion. Subcutaneous plexiform neurofibromas are often overlying the incision area. When posterior spinal fusion surgery is performed, one should be aware of the very thin laminae, which are often eroded by dural ectasia surrounding the spinal cord in the thoracic region. The laminae, the pedicles, or both may be inadequate to accept hooks; pedicle screws, sublaminar wires, or Universal Clamps may be necessary. Considerable bleeding may occur with dissection around subcutaneous vascular tumors. The authors recommend using monopolar and bipolar electrocautery for subperiosteal exposure of the posterior elements. Posterior subperiosteal dissection is performed by using Bovie electrocautery dissection rather than subperiosteal elevators because of the potential presence of laminar defects or the possibility of inadvertently plunging through the lamina and directly damaging the spinal cord. Anterior spinal dissection may be complicated by venous lakes and engorgement of saccular, almost sinusoidal, vessels, which are difficult to control in and around the vertebral bodies. Extensive blood loss from the blood vessels in the cancellous bone of the vertebral bodies is distinctly possible. The authors recommend using a putty of Gelfoam (Pfizer, New York, NY), Avitene (Bard Davol, Warwick, RI), and thrombin. In addition, FloSeal (Baxter, Deerfield, IL) will assist in controlling bleeding, and Tisseel (Baxter) should be available for dural leaks. Diskectomies should be performed with Bovie dissection and use of a rongeur through the annulus fibrosis instead of sharp dissections of the endplate apophysis. Sharp dissections may cause significant bleeding from the often-friable cancellous matrix of the vertebral bodies. Rib head dislocation into the spinal canal should be ruled out by means of MRI before any attempt at surgical correction of the spinal deformity because correction may result in spinal cord impingement by the unrecognized dislocated rib head. Resection of the rib head is the most effective way of preventing the rib from being forced into the spinal cord during correction maneuvers. Ileus is not infrequent when a staged anterior and posterior spine surgery is performed and while the patient is kept in craniofemoral traction. Therefore, preemptive nasojejunal tube placement and hyperalimentation are strongly recommended for all patients who undergo staged anterior and posterior surgery. Progression of the deformity and erosion of bony elements may be noticed after solid spinal arthrodesis. Thus, close follow-up is needed even after successful spinal fusion. Bracing can be both preventive and therapeutic. Children should be fitted with polypropylene knee-ankle-foot orthoses (KAFOs) as soon as they start to stand or walk around furniture. The KAFO is worn on a full-time basis, except during bathing. Pulsating electromagnetic fields may also be used in the treatment of tibial dysplasia. The source of the fields may be external, such as the clamshell device over an ankle-foot orthosis (AFO), or an internal unit may be implanted in the soft tissue around the area of pseudarthrosis, usually in conjunction with an autogenous bone graft. The effectiveness of this form of treatment remains highly controversial. Obvious documented fracture is the only current direct indication for surgery in congenital tibial dysplasia. In children older than 5 years, subsequent bracing above the knee and articulated at the knee and ankle has been tremendously successful in managing angular deformities and preventing fractures. The surgical treatments include direct bone grafting, vascularized autogenous grafting, compression and distraction osteogenesis, and amputation. Subperiosteal dissection should be performed to expose the pseudoarthrosis site in congenital tibial dysplasia. Both ends are freshened, and a decision is made regarding whether an intermedullary rod or external fixation should be used. Use of an autologous iliac crest bone graft is highly recommended, regardless of the surgical procedure. A vascularized fibular bone graft is another option. In following these patients, careful attention is paid to the ipsilateral distal fibular physis. If shortening occurs after a fibular fracture occurs or if the tibial operative procedure positions the distal fibular physis above the ankle joint, the foot and ankle will be in fixed valgus. Autogenous bone is placed into the excised pseudarthrosis site. An intramedullary rod is placed from the proximal tibia across the pseudarthrosis site, incorporating the graft and extending down through the ankle, across the talus, and into the calcaneus. Rod replacement is required as the patient grows, and continuous bracing is necessary. A telescoping rod may be used and affixed to the distal tibia. Another variation is to retrograde a rush rod from the calcaneus across the ankle, incorporating the grafted segment and continuing into the proximal tibial metaphysis, as described by Peter Williams. Most centers allow off-label use of bone morphogenetic protein (BMP) to support osteosynthesis. The McFarland procedure,  placing a fibular allograft strut in the concavity of the bowed tibia, has been reintroduced into the options of bone grafting. It is usually performed as prophylaxis, before the fracture occurs. The most popular vascularized graft is the contralateral fibula, which is followed by the iliac crest. The graft is removed extraperiosteally and placed into the pseudarthrosis site. The blood vessels are then anastomosed to those normally supplying the tibia. Stabilizing the grafted segment is necessary. The distal tibia and fibula of the normal leg must be fused to prevent proximal migration of the fibular and ankle valgus. Problems associated with vascularized grafts include progressive angular deformity, failure to achieve complete length, failure to unite with consequent further pseudarthrosis, valgus ankle instability, and disability in the donor limb. Compression and distraction histogenesis of bone and soft tissue using the Ilizarov method offers many theoretical advantages in the treatment of this problem. 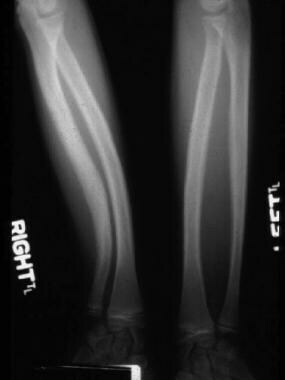 Unfortunately, the early, glowing reports of bony synostosis failed in patients in whom bracing was not continued. Efforts now are being directed toward distraction and/or compression histogenesis over an intramedullary rod. Early reports are encouraging. The Taylor spatial frame has replaced the Ilizarov as the external fixator of choice in some centers, but the technique is essentially the same. The system is more expensive. Amputation remains a viable alternative (see the image below). The weightbearing surface of the foot should be maintained á la Boyd-Syme amputation, as opposed to a transtibial amputation that predisposes the child to subsequent surgeries for bony stump overgrowth. The length from this procedure adds biomechanical stability to prosthetic wear. The new Seattle foot and/or runner's foot have made prosthetics more functional, and participation in team sports such as soccer is not prohibited after this procedure. Below-knee amputation for tibial pseudarthrosis. Regardless of the procedure used, some form of bracing is required for all of these patients until skeletal maturity is achieved. The potentially high incidence (25%) of subsequent central nervous system neoplasms should prompt consideration whether attempts at bone grafting should be continued after three or four procedures. By the time the child is aged 7 years, the benefit of further procedures, as opposed to amputation, should be scrutinized carefully. Plexiform neurofibroma of right thigh. The zones of overgrowth in bone and soft tissues are usually unilateral, involving the lower extremities or the head and neck. These osseous changes characteristically cause the bone to elongate with a wavy irregularity or thickening of the cortex. A higher incidence of neoplasia is associated with segmental hypertrophy than with other lesions. Attempts to debulk the soft tissue and to resect the bone have not necessarily resulted in significant cosmetic improvement. Early epiphyseal arrest of the involved bone or leg lengthening of the normal, short side has shown improving results but is not perfect. Bracing of progressive dystrophic curvatures is contraindicated simply because they have not been found to be effective. Some parents request bracing in spite of literature results questioning its efficacy. The authors' investigations have revealed a transition of idiopathic-type curves to dystrophic types (modulation). Posterior spinal fusion alone is now believed to be contraindicated in young patients with progressive deformities. An anterior diskectomy and intervertebral fusion followed by posterior spinal fusion is the recommended procedure. The use of segmental fixation with instrumentation, as well as postoperative bracing, is highly recommended. The elective correction of angular deformities for cosmesis is strongly contraindicated. The risk of pseudoarthrosis is too great. Consequent bracing and protection until skeletal maturity is highly recommended. Skeletal maturity does not prevent fracturing, but in most instances, the patient becomes reasonable enough to refrain from taking the contraindicated risks. Gutmann DH, Ferner RE, Listernick RH, Korf BR, Wolters PL, Johnson KJ. Neurofibromatosis type 1. Nat Rev Dis Primers. 2017 Feb 23. 3:17004. [Medline]. Crawford AH, Schorry EK. Neurofibromatosis in children: the role of the orthopaedist. J Am Acad Orthop Surg. 1999 Jul-Aug. 7 (4):217-30. [Medline]. Crawford AH. Neurofibromatosis in childhood. Instr Course Lect. 1981. 30:56-74. [Medline]. Crawford AH. Neurofibromatosis in children. Acta Orthop Scand Suppl. 1986. 218:1-60. [Medline]. Wozniak W, Karwacki MW. Is "watchful waiting" superior to surgery in children with neurofibromatosis type 1 presenting with extracranial and extramedullary tumor mass at diagnosis?. Childs Nerv Syst. 2008 Dec. 24 (12):1431-6. [Medline]. de Oliveira MG, Pozatti Moure S, Sérgio Batista P, Moraes Chaves AC, Rados PV, Sant'Ana Filho M. NF1 diagnosis criteria and associated sarcomatous tumor review of the literature and case report. Oral Maxillofac Surg. 2008 Dec. 12 (4):231-5. [Medline]. Cairns AG, North KN. Cerebrovascular dysplasia in neurofibromatosis type 1. J Neurol Neurosurg Psychiatry. 2008 Oct. 79 (10):1165-70. [Medline]. Yong-Hing K, Kalamchi A, MacEwen GD. Cervical spine abnormalities in neurofibromatosis. J Bone Joint Surg Am. 1979 Jul. 61 (5):695-9. [Medline]. Curtis BH, Fisher RL, Butterfield WL, Saunders FP. Neurofibromatosis with paraplegia. Report of eight cases. J Bone Joint Surg Am. 1969 Jul. 51 (5):843-61. [Medline]. Isu T, Miyasaka K, Abe H, Ito T, Iwasaki Y, Tsuru M, et al. Atlantoaxial dislocation associated with neurofibromatosis. Report of three cases. J Neurosurg. 1983 Mar. 58 (3):451-3. [Medline]. Hsu LC, Lee PC, Leong JC. Dystrophic spinal deformities in neurofibromatosis. Treatment by anterior and posterior fusion. J Bone Joint Surg Br. 1984 Aug. 66 (4):495-9. [Medline]. Sirois JL 3rd, Drennan JC. Dystrophic spinal deformity in neurofibromatosis. J Pediatr Orthop. 1990 Jul-Aug. 10 (4):522-6. [Medline]. Durrani AA, Crawford AH, Chouhdry SN, Saifuddin A, Morley TR. Modulation of spinal deformities in patients with neurofibromatosis type 1. Spine (Phila Pa 1976). 2000 Jan. 25 (1):69-75. [Medline]. Lykissas MG, Schorry EK, Crawford AH, Gaines S, Rieley M, Jain VV. Does the presence of dystrophic features in patients with type 1 neurofibromatosis and spinal deformities increase the risk of surgery?. Spine (Phila Pa 1976). 2013 Aug 15. 38 (18):1595-601. [Medline]. Li M, Fang X, Li Y, Ni J, Gu S, Zhu X. Successful use of posterior instrumented spinal fusion alone for scoliosis in 19 patients with neurofibromatosis type-1 followed up for at least 25 months. Arch Orthop Trauma Surg. 2009 Jul. 129 (7):915-21. [Medline]. Helenius IJ, Sponseller PD, Mackenzie W, Odent T, Dormans JP, Asghar J, et al. Outcomes of Spinal Fusion for Cervical Kyphosis in Children with Neurofibromatosis. J Bone Joint Surg Am. 2016 Nov 2. 98 (21):e95. [Medline]. Lin T, Shao W, Zhang K, Gao R, Zhou X. Comparison of Outcomes in 3 Surgical Approaches for Dystrophic Cervical Kyphosis in Patients with Neurofibromatosis 1. World Neurosurg. 2018 Mar. 111:e62-e71. [Medline]. Hardinge K. The McFarland by-pass procedure in infantile pseudarthrosis of the tibia. Ann R Coll Surg Engl. 1971 Jan. 48 (1):6-8. [Medline].